At CES 2017 Intel has unveiled the Intel Compute Card. It is designed to bring computer power and connectivity "to virtually any product, anywhere," and is thus a very compact but modular design. However, it does contain all the elements of a full computer within its small and slim frame. 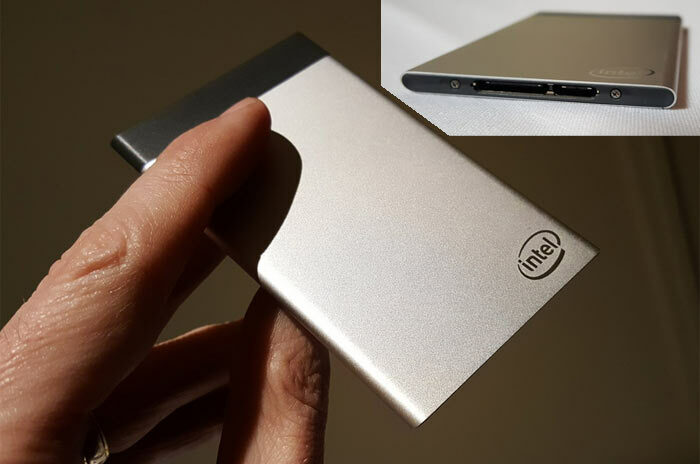 Credit card sized is an often overused term but Intel does indeed get pretty close, with its 95 x 55 x 5mm device. The Intel Compute Card contains an Intel SoC, memory, storage, and Wi-Fi / Bluetooth connectivity, with flexible I/O options available. 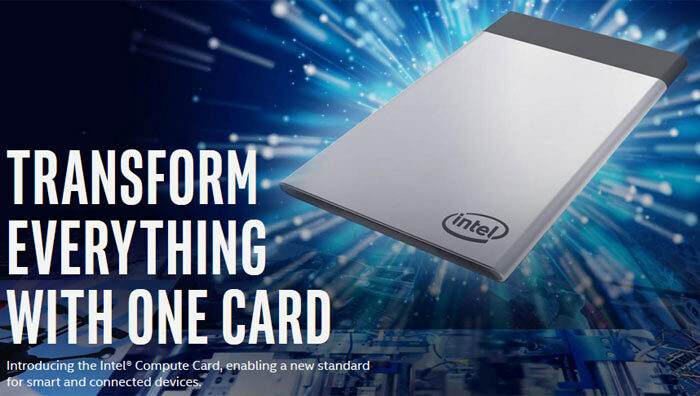 We don't have a detailed spec list unfortunately, but users will be able to configure the card with a range of processors including the latest 7th Gen Intel Core processors with vPro. Thus makers will be able to choose from a range of Intel Compute Card solutions to fit their performance and price requirements. It is envisioned it will be snapped up by hardware makers for deployment inside an array of things including; interactive refrigerators, smart kiosks, security cameras, and IoT gateways. Intel reckons this will help speed up innovation in smart and IoT connected machines around homes and businesses. So far Intel has signed up some pretty big names in consumer electronics to bring their future wares to market packing Compute Cards. Famous names dropped by Intel so far are; Dell, HP, Lenovo, Sharp, InFocus, DTx, and TabletKiosk. Intel says that its Compute Card will start to become available from mid-2017. And, like the Intel compute Stick 2015, WiFi speeds will be abyssmal and the WiFi chipset will continue to be at conflict with the Bluetooth chipset. It's like a Raspberry Pi Compute Module that completely misses the point. Well done Intel. Intel hasn't given us specific information about the specs and speeds of its first Compute Cards, but you can expect the fastest ones to approach the performance of high-end fanless laptops like Apple's MacBooks. Intel told us that processors with a TDP of up to 6W could fit inside the Compute Cards, which covers both low-power Atom chips like those that powered early versions of Intel's Compute Stick to full Core M and Y-series Core i5 and i7 CPUs like the ones you find in laptops. I think it is pretty nifty they have managed this,but it does seem more like a solution looking for a problem! !